This quilt measures 71.5" square. I wish I could tell you who designed it, or where to find the pattern, but I just don't know. It could be original, but I kind of suspect it is a pattern. 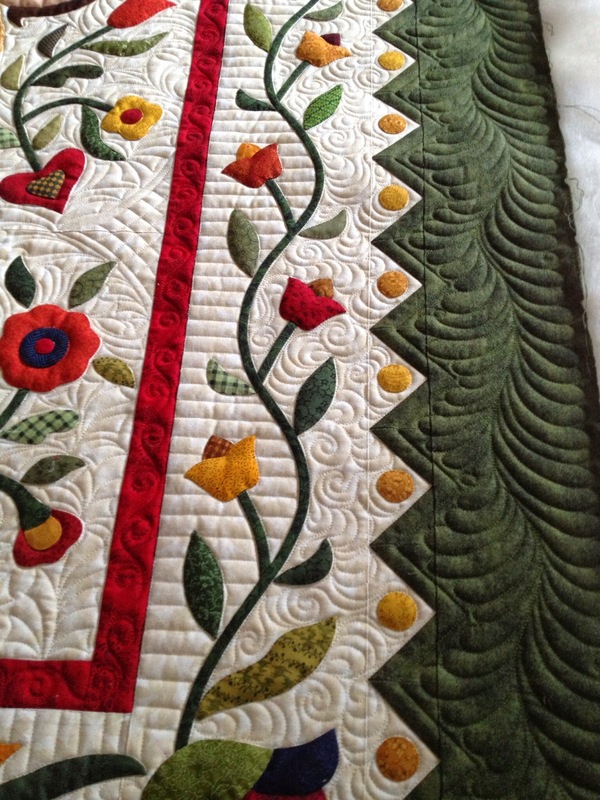 It is beautifully turned edge applique. 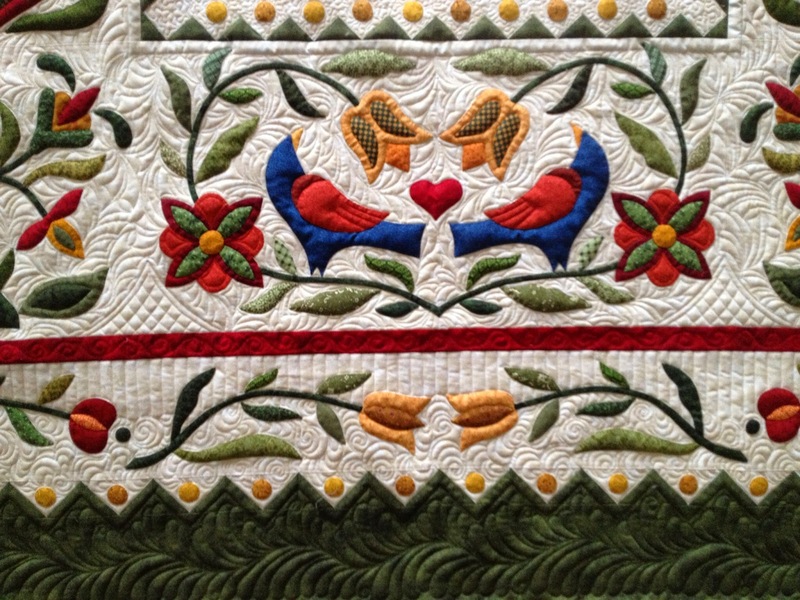 This quilt has a single wool batt to give excellent relief to all of these appliques. I don't like to really stitch on the appliques themselves unless they are quite large, because it tends to flatten them, but this quilt has plenty of puff. I spent hours (and I do mean hours...something like 8 I believe) ditching around every applique, every blasted circle, and there are more than 100 of them too! I used a clear Madiera monolon thread for the ditching. 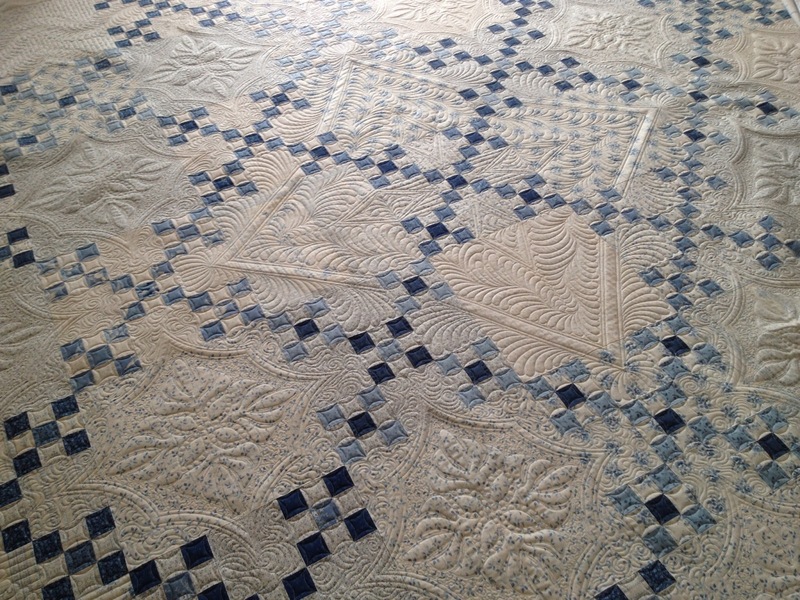 The remainder of the quilting is done with an old standby - Superior So Fine. I haven't done an entire quilt with SoFine in ages, since the advent/discovery of Glide thread and Omni and others that I frequently use. The SoFine did a fantastic job. 50 wt is just fine enough for the background quilting to be dense but not thready. A background like this one has just enough room to try to develop a design. I like to use the straight line work paired with a swirlier filler. It makes a nice juxtaposition. They are enough different from eachother that each of the fills shows completely. It is useless to place 2 fills beside eachother if they just blend away. The border has a pretty and fairly wide undulating feather. Just a nice classic look. I placed sections of curved cross-hatching inside of the center section (above) as well as the next border (below). Again, it just gives enough contrast of design to keep the viewer's eye jumping around. She's definitely not my favorite part of the quilt!! 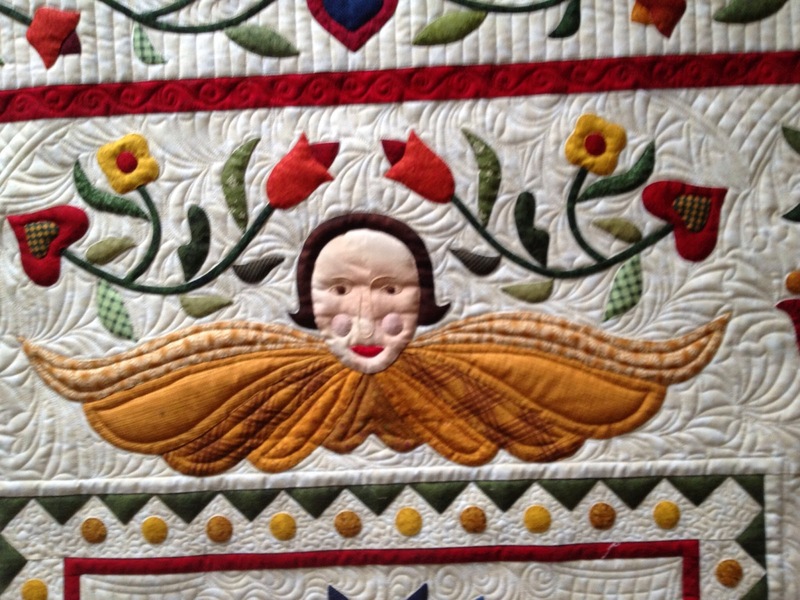 There are few things I struggle with quilting, but faces are definitely one of them. The quilt has a very neutral backing so all the quilting is very evident. I love this when the thread matches, but it always makes me nervous when there are dark green and red bobbins too! It means that you have to be ultra-careful while quilting to be sure that the backtracks are as clean as possible. ...and the center square. The texture is fantastic thanks to the wool. I have a real Baltimore Album quilt loaded at the moment. It is taking a way lotta hours to ditch, but I should be onto the fun quilting tomorrow. I expect to finish it before I leave for MQX next Wed. If you live within driving distance of Manchester, NH, consider coming to MQX next weekend (Thurs - Sat). 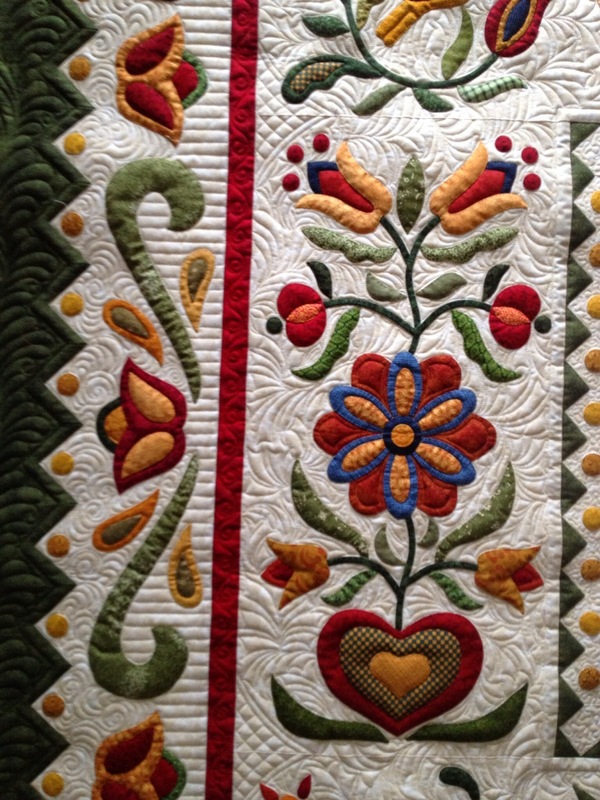 It is a great machine quilting show. 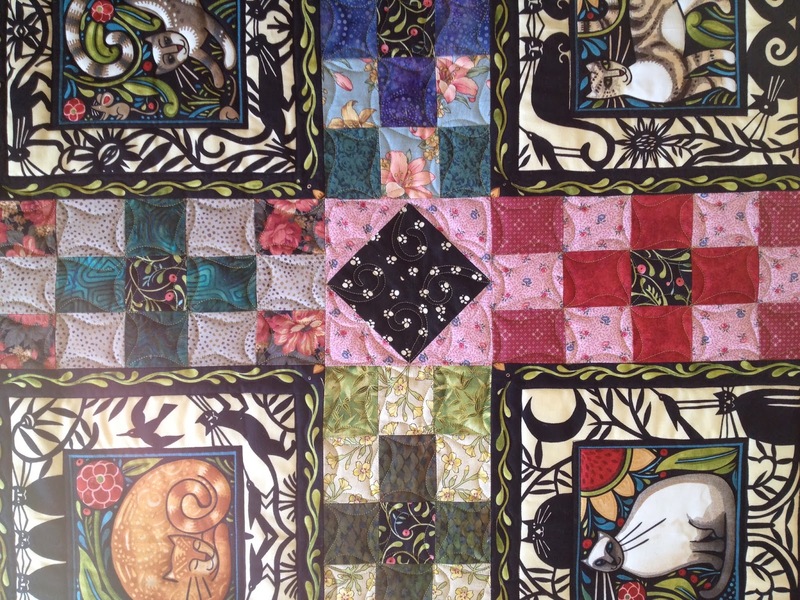 I have 4 quilts entered, but there are probably many, many more quilts better to see there! Last week, after finishing the blue and white quilt I showed last post (and two other edge-to-edge quilts), I loaded a full custom applique quilt. I quickly discovered that the timing of the machine had been severely messed up from an incident a couple weeks previous, when a needle fell out. Oddly, I had no difficulty running the 40wt Glide and Omni that I used on these 3 quilts, but the machine couldn't make the stitch using thin monofilament. I had initially planned to take the machine in for servicing next month on the week my kids are out of school, but fate had other plans. The machine was dropped off on Thursday and wasn't back online at home until yesterday. I also got to dig my nose back into a small silk quilt I started 2 months ago. I bought the hand-dyed Radiance fat quarters (all shades of green) in Houston. They are so much prettier in person, and brighter too. Last time I worked on this, all I finished was the center block, and the border with the HST's, then I discovered I miscut something, and didn't really have enough to do the last larger border. Designing even a 40" quilt with only fat quarters is a challenge. I ordered a half yard of a couple deeper greens (not the hand-dyes), and got right to the piecing. Oddly (or not so if you know me), after one day of piecing, I only managed to get the inner diamond border pieced, and the units attached to make what is shown above. Those Y-seams and matching the 8 corners on them were a wee challenging, but to my pleasant surprise, I made them all on the first try! This is a lovely 94" blue and white double Irish chain. When I get quilts such as this, with HUGE open squares (the blank square is like 13-14"), it becomes a daunting task of what to put in the square. 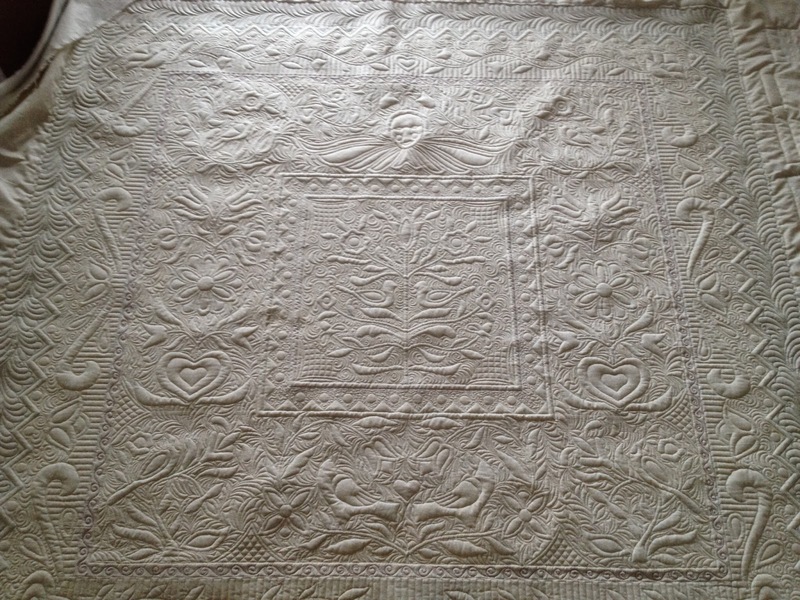 I know that this blank square is a large part of the overall look of the quilt, and must be quilted wisely to maximize the quilt's appearance. There are 24 blank blocks! There are no borders on this quilt (not like you can really see that from my photo...I have nowhere to just lay the entire quilt out!). It is just squares. 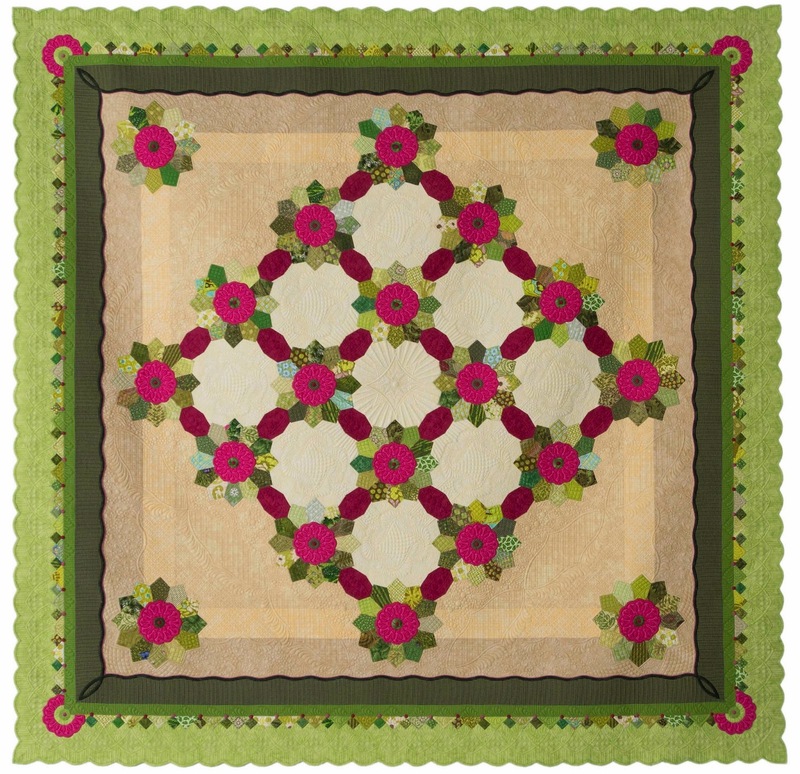 So, one of my first tasks in designing the quilting is to try to design faux borders into the quilting. The other task is to create a visual focal, the other thing missing when all blocks are the same. There absolutely must be a place for the eye to rest. Below is what I did for the outer border. That is the lower right hand corner. My client commented that she likes feathers. 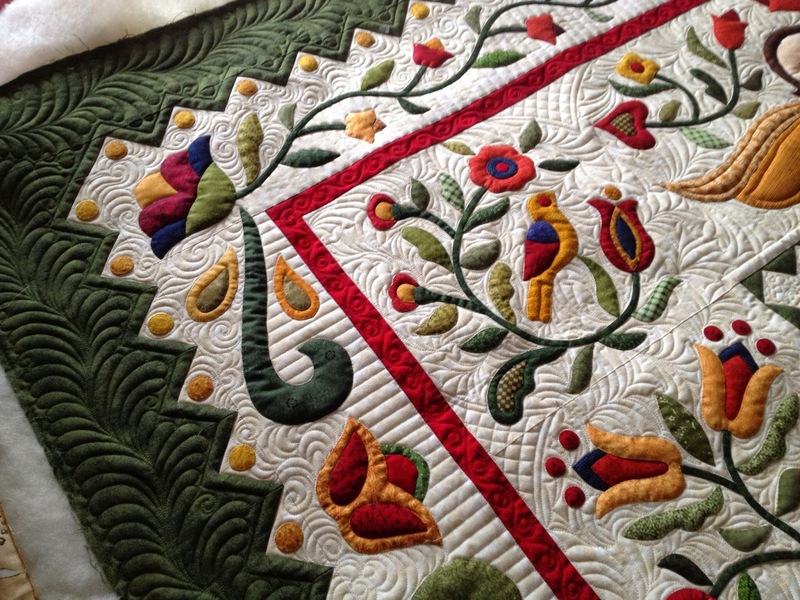 Heck, most people do, and this is a great quilt to use feathers on. It's already delicate and soft; feathers only intensify that. The edge has a wide meandering feather, and parallel 1/2" lines spanning out to the outer edge. This will be very pretty as it hangs (it may be attending some shows) or lays on a bed. One thing to note is that this quilt has just a single layer of Hobbs 80/20 batting. It is a mid-weight, but is not very bulky. The loft is limited, and is certainly not as puffy as some show quilts that I do which have a wool batt or even double battings. The single layer is perfect for a bed, as well for a budget-minded quilt. Not all quilts get the added $50 for the wool! Had this been darker colors or heavier prints, I would have rallied for a fluffier batting to show off the quilting. Light and whites tend to do just fine with single layers. The center has a large star, with plenty of feathers, inside and outside. 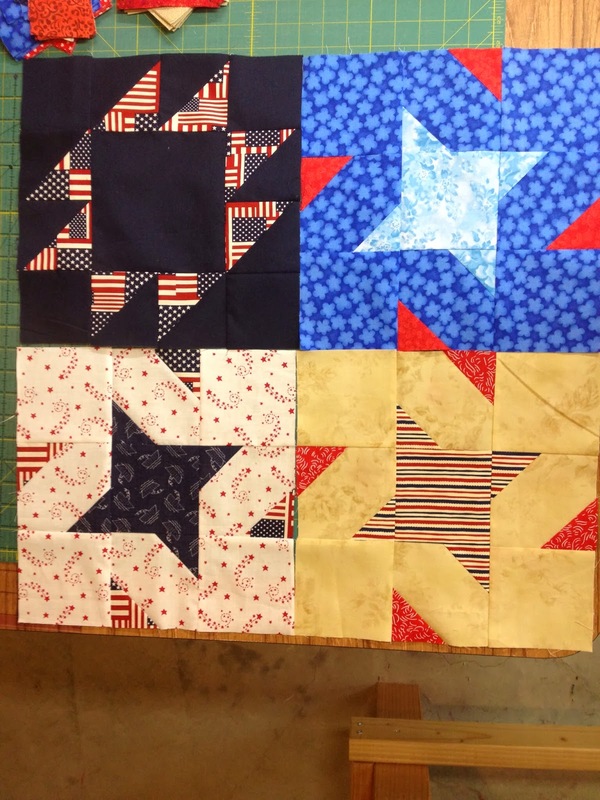 The twelve blank blocks around the center star are quilted with a lovely stencil design. I bought several stencils last year and am slow to pull some of them out. This actually fills a 12" block, but I placed it on point for a different look. The arcs that surround the stencil are done with my curve-crosshatch ruler with minimal marking. The addition of 1/4" channels inside and outside of the main 1/2" channel make the shape much more visible. I then densely stippled inside the space to make the stencil shape pop. 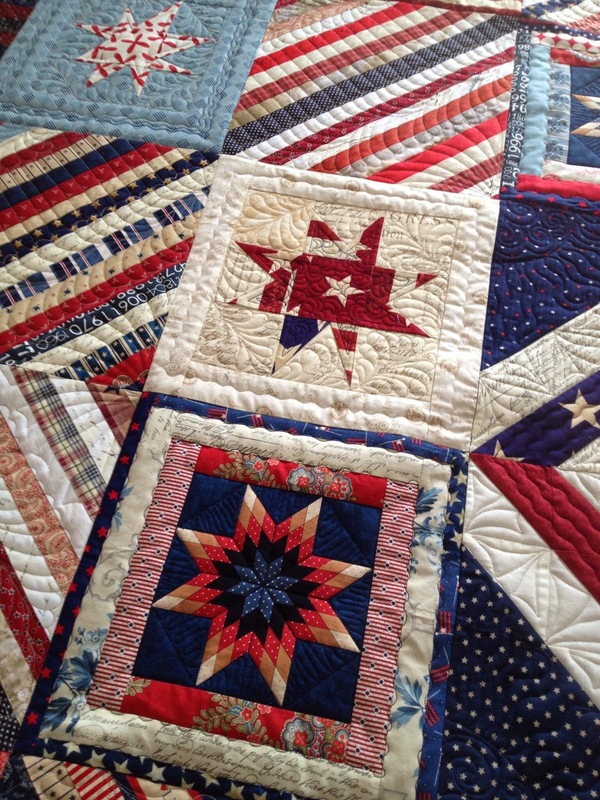 You can see below how pretty and unique the quilt looks with these. I really like it. I used two similar 40wt threads - Glide in ivory and a pale blue (for the swirl-McT filler) YLI polished poly. 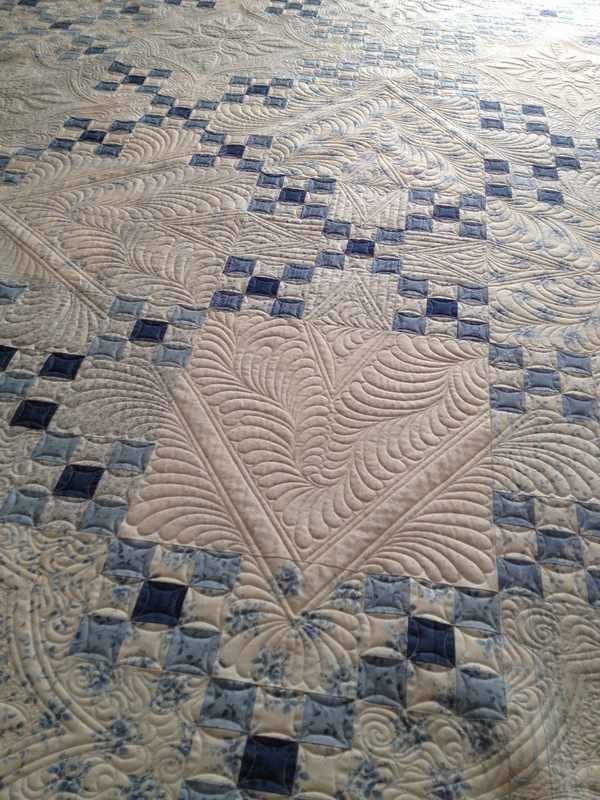 They lend a soft sheen to the surface of the quilt, and a nice delicate look. Lastly, all of the 9-patch blocks are CC'd with the absolutely tiniest of circles. I used my 1-1/2" circle to stitch all of these 2" diameter circles. Now, to find a box and get this sent off to NH, and get onto the next (sigh...!) custom quilt in the queue. 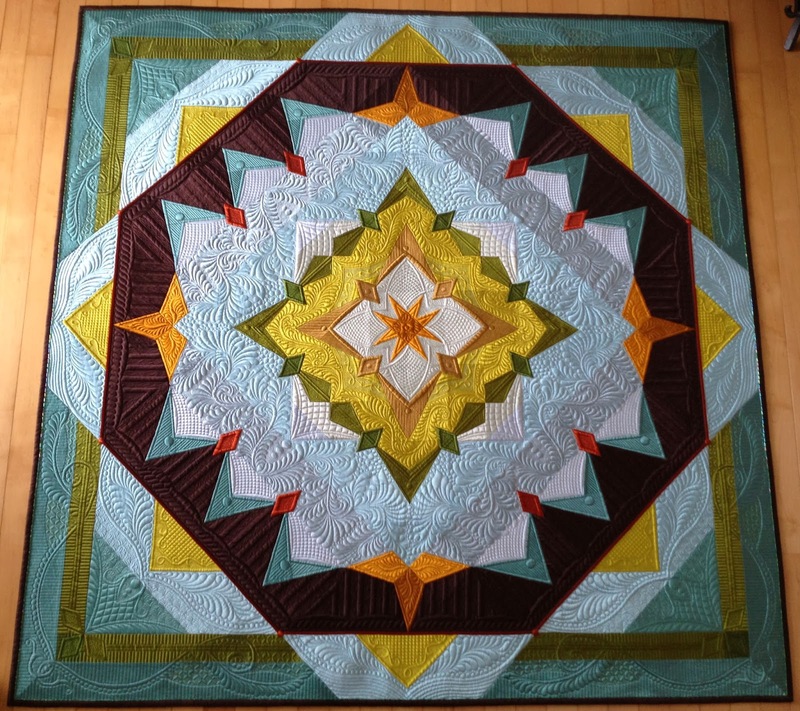 I received word last night from AQS that my quilts entered at their Lancaster, PA show had done very well. It is always exciting to see the caller ID listed as "Paducah, KY" near one of their shows, because I know that they don't call just anybody for no reason. I knew it was a good call. Seriously, even a 3rd place at their shows is a very sweet check. The call was a good call indeed. She starts the conversation, "Margaret, are you sitting? 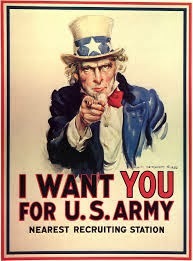 You might want to be". Oh my, I thought, could this really be happening? It was happening. Both of my quilts took top-tier awards at their show. 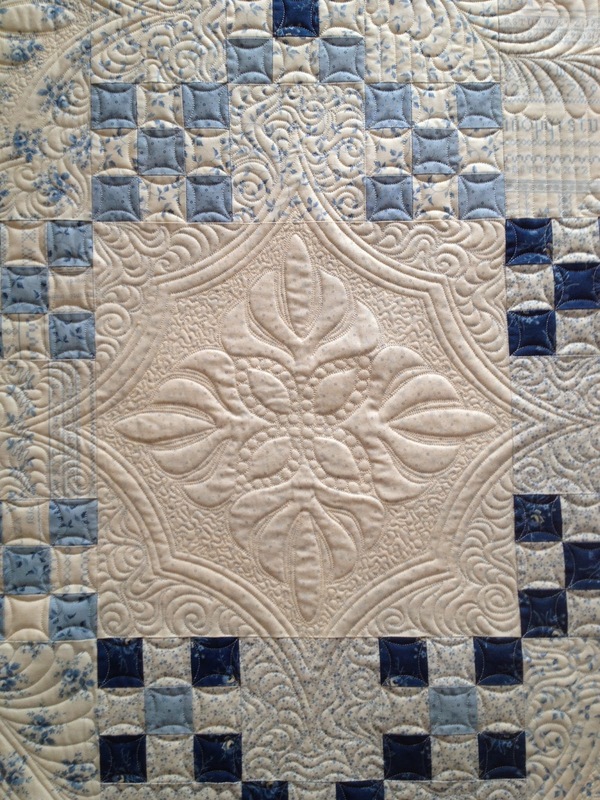 Zen Garden won the best Longarm Quilting award, while Big Bertha won Best Bed quilt. I had hoped and thought that Bertha would ribbon, but this was most certainly beyond my wildest dream. It is still surreal. It's no secret that these are two of my favorite quilts. But Zen Garden didn't start out as such a show-stopper, or winner is perhaps a better word. 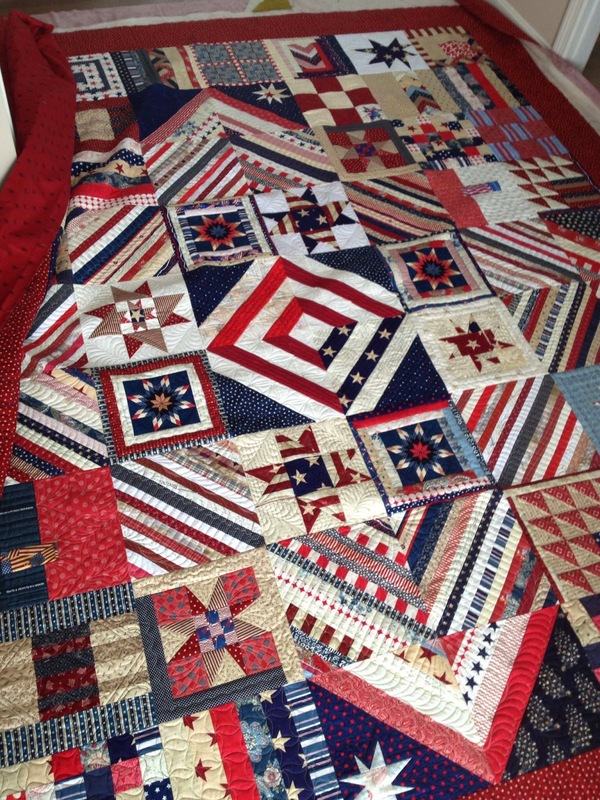 I love the quilt, but the first year I started showing it, I think the quilt got 3 honorable mentions, and a couple of 2nd places at smaller regional shows. I just wasn't convinced it had what it took to play with the big dogs. Shows like Lancaster have very big dogs. Last year, though, Zen Garden started to show it's worth, from being on the cover of a magazine to several first places, acceptance into Paducah, and a couple Best of Shows. I am glad I kept showing it, despite its slow start. This is its last year of show eligibility with many of the major shows, so it will be busy on the road this year. Big Bertha, well, it just surprised me right from the beginning. It has done well pretty much everywhere it has gone, except for Houston. I look at Houston as just a small blip on the radar. Getting into that show was it's point of fortune, but it's hard to compete with a room full of top dogs. This was a quilt that almost didn't happen. I started it in the summer of 2011. In the fall of 2012, I was looking at all the unfinished projects in my studio, searching for a quilt that I "should" finish. This one was the closest to being ready to quilt. 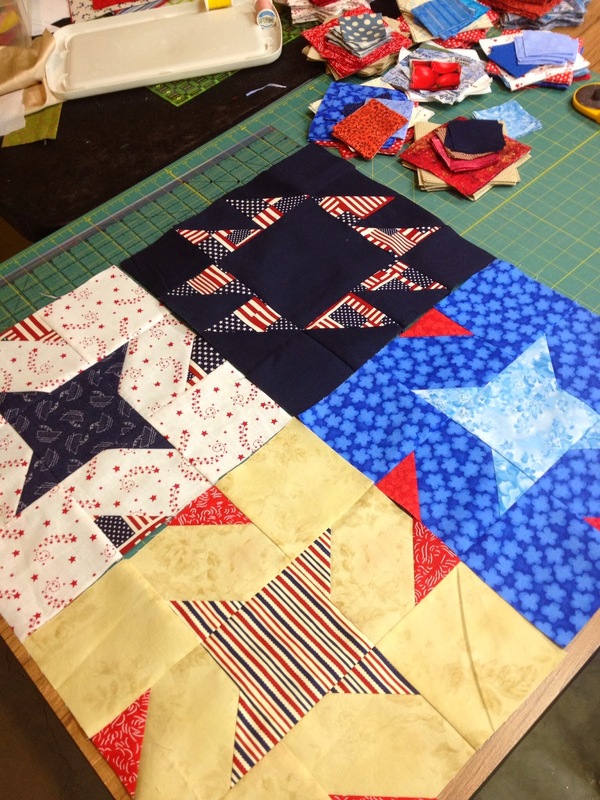 I had set it aside because soon after I had most of my Dresden blocks hand pieced, Dresden quilts started popping up everywhere on quilty-blogland. 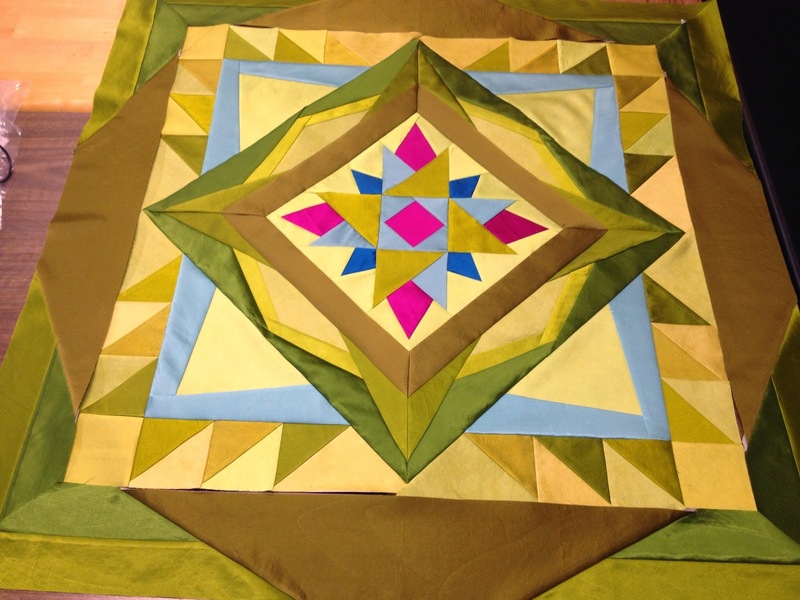 I hate making anything but original quilts, and to think that hundreds of others were making their own scrappy Dresden plate quilts was annoying. Mind you, I'm not the trendsetter, as they weren't copying me. It was purely coincidence. As a result, I tried hard to find an original setting for the plates. Hindsight will say that I really dislike how I quilted areas of this quilt, but I had a judge tell me that the originality and different quilting was a catching feature. Live and learn. So, if you are in the Lancaster area, be sure to go to the show. As I knew when the list of accepted entrants was announced 2 months ago, this is a show of pure delight. The field of talent is deep and strong. The winners are here. Likely because AQS changed their rules allowing previous ribbon winners to re-enter their shows, this show is stacked with great quilters. I know many of the names, and some people personally. I am so touched to have been recognized so immensely by the judges. Remember, I have been making show quilts just a mere 4 years, or more like 3 since the first quilt I made for show was purely accidental. If I can do it, so can you. Keep dreaming. Keep quilting. I posted directions for them within the last 2-3 weeks. They finish 12-1/2" (raw). The three stars are a basic 9-patch construction, while the other one is a 16-patch type construction. I make them up at a rate of about 6-8 per hour, once they are cut out. Very quick. 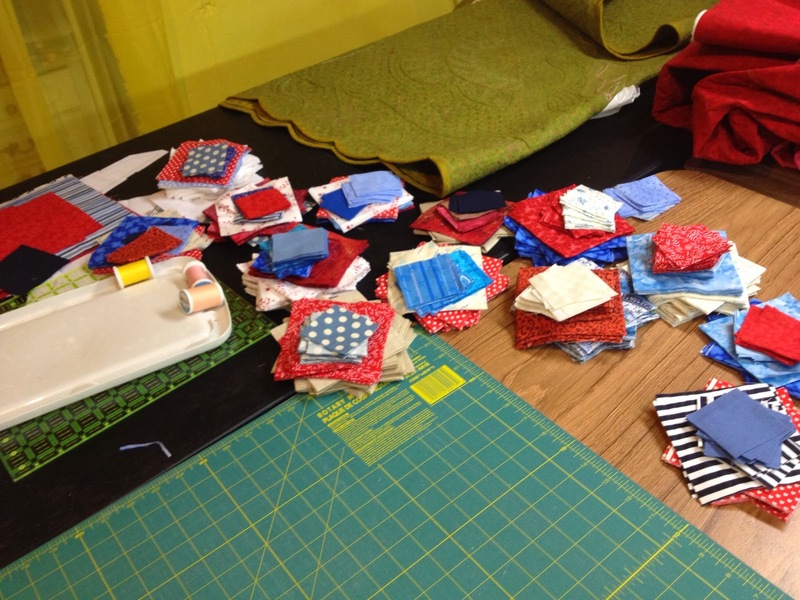 As you can see below, I have a production line of blocks ready to be stitched, or if you are me, you are mumbling "what a mess!". It is about 75 more blocks. I have now made over 200, and much of this fabric was pulled from my stash. I would love to have some more (Yes, I have gotten a few already!) blocks from my blog readers to bring to the show to donate. You can email me directly if you have questions, or have a look here. If you do decide to send some directly to me, email for the addy, and I must have them by April 5th. This is for her daughter, as a wedding quilt. She must be some patriotic!! I used Omni thread in dark blue and tan, and it has a Hobbs batting. FYI, if you want to use wool, the Tuscany has just been the worst lately for quality and variability. Please avoid it and use Hobbs Heirloom or Quilters Dream wool. This is the center. Because the piecing didn't align exactly, I didn't want to use ruler work because that would accentuate that. 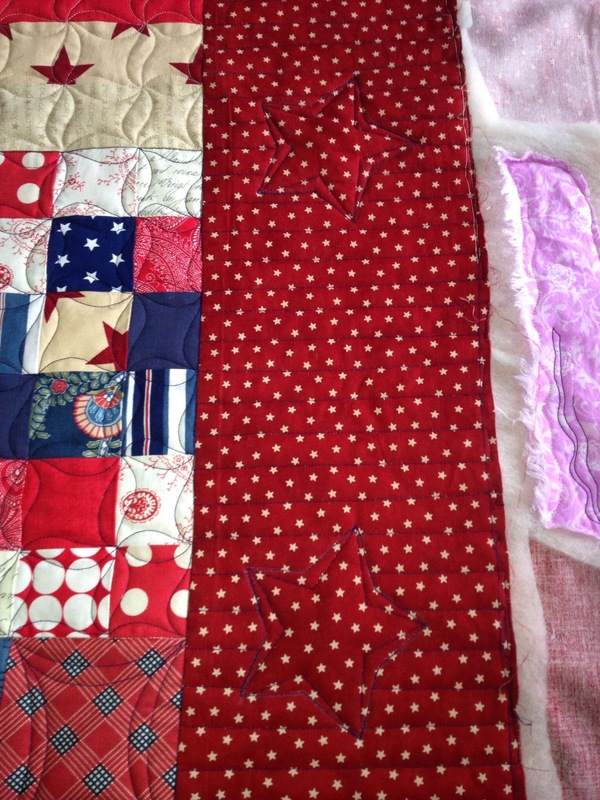 Instead, I did free quilting in the white and wavy lines in the red. I have used wavy lines in several blocks too. 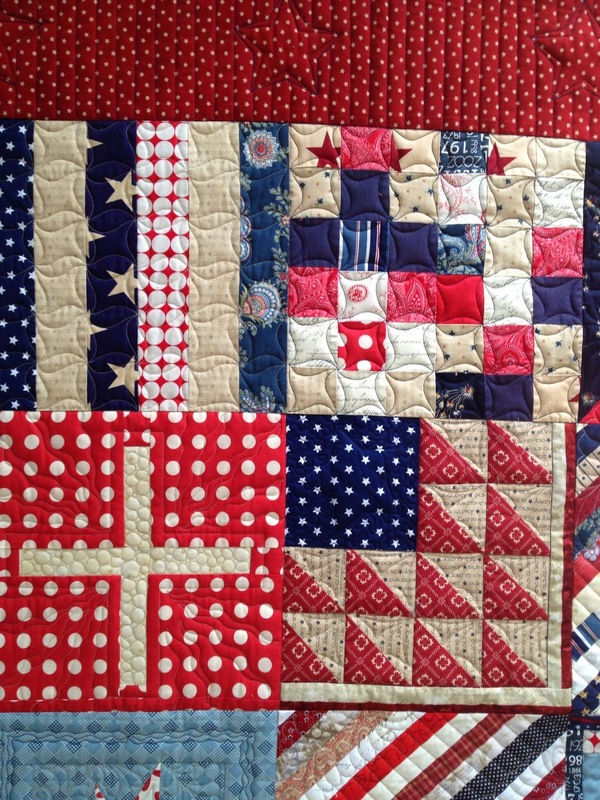 They kind of remind me of the waving flag, and look less formal on a fun quilt like this one. 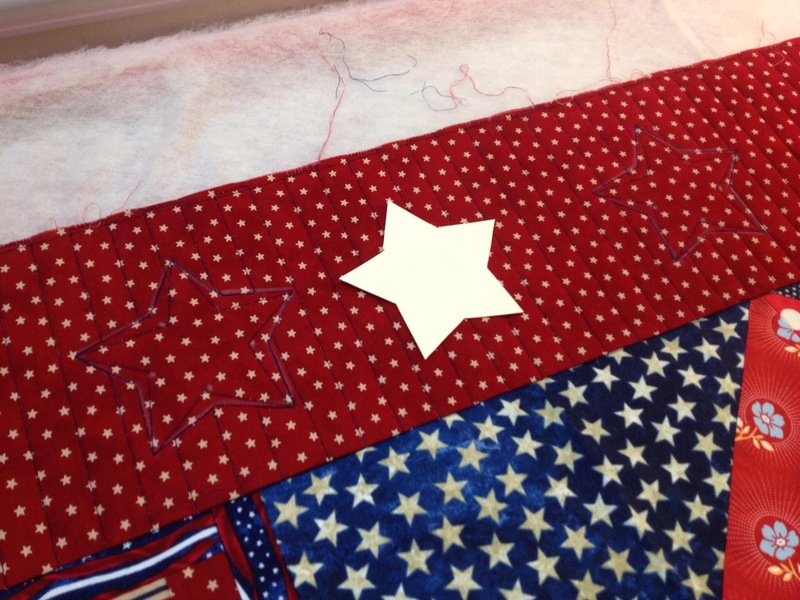 On the outer border, which is 6-1/2" wide, I made a star from a file folder. It's traced with chalk across the border, and then stitched with a ruler. 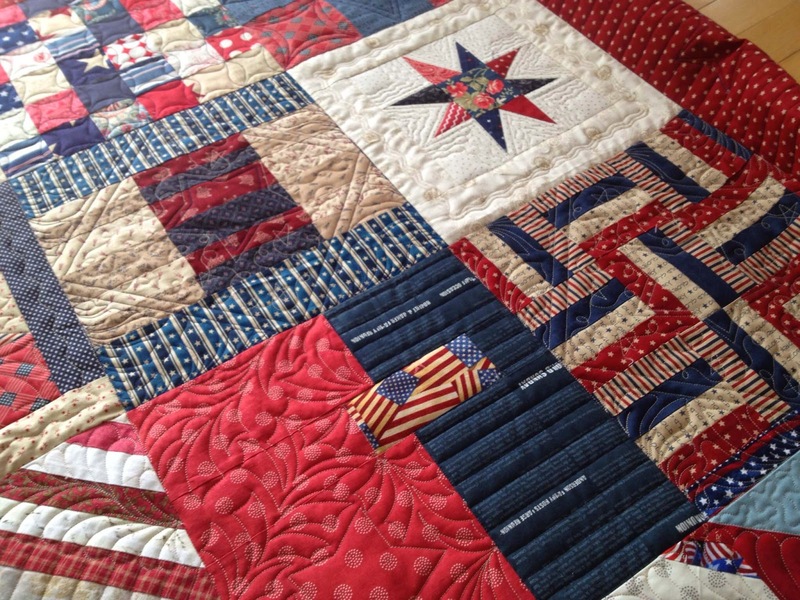 The blue thread shows some, but quilts with massive amounts of print are a struggle to get anything to show. It is currently winging its way to southern California, so the owner can finish a very long binding (he he!). One more lool...I like the blocks with Terry-Twist. One thing I found was that many blocks were trimmed down, so one row of squares appeared thinner than the others. If I just did a C-C, this would be evident. The Terry-Twist gives more movement to the stitching, and tricks the eye. As this very lazy daylight savings day is coming to an end, I'll give one more push to please consider donating a few blocks. Imagine how many would be made if each reader only made a couple? 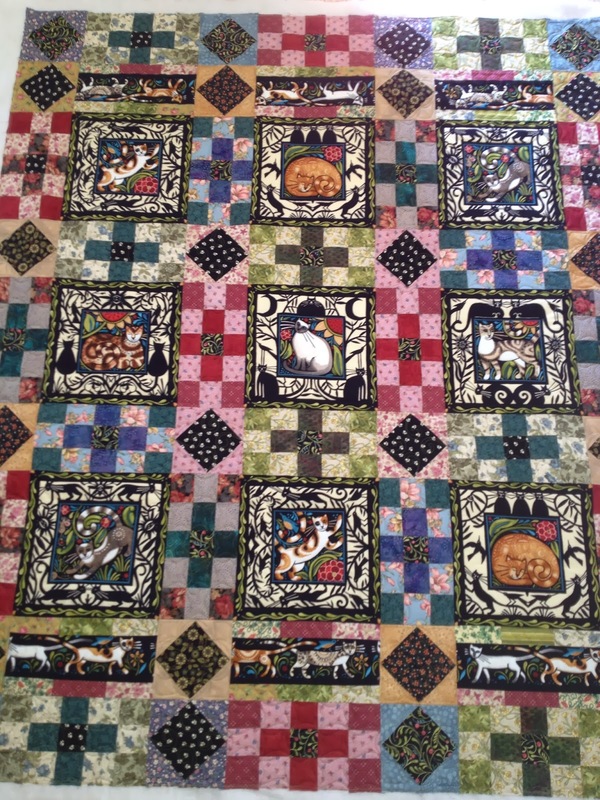 Here's a cute lap quilt I quilted a couple weeks ago. I have never seen these cat panels that my client used. She said most of the other fabrics, which I discovered coordinated so sweetly, came from her stash. This was a harder quilt to quilt because I was budget-poor. I would have loved to have had more time to do more on the cat squares. This can frustrate me, but fortunately the client didn't care. Oh my, I just noticed that the top row of cats is upside down...wonder if she knows this too?! To conserve costs, and avoid doing a true edge-to-edge, I looked for continuous-paths for the quilting around the cat squares. The Terry-Twist is a great alternative to a real continuous curve (also called C-C) because no rulers are needed, and it is faster. 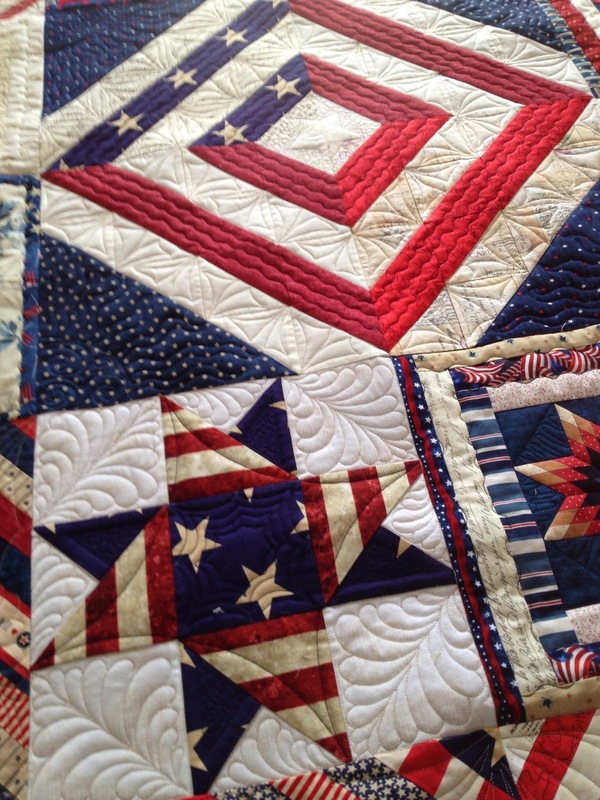 It gives a nice "swing" to the quilting too. It was challenging here because in this section of squares, not all are square. Some are rectangles. In the black squares on point, I did curls, intended to look like cat's tails. She brought the batting, and it is a thinn-ish polyester, the type JoAnn's sells. 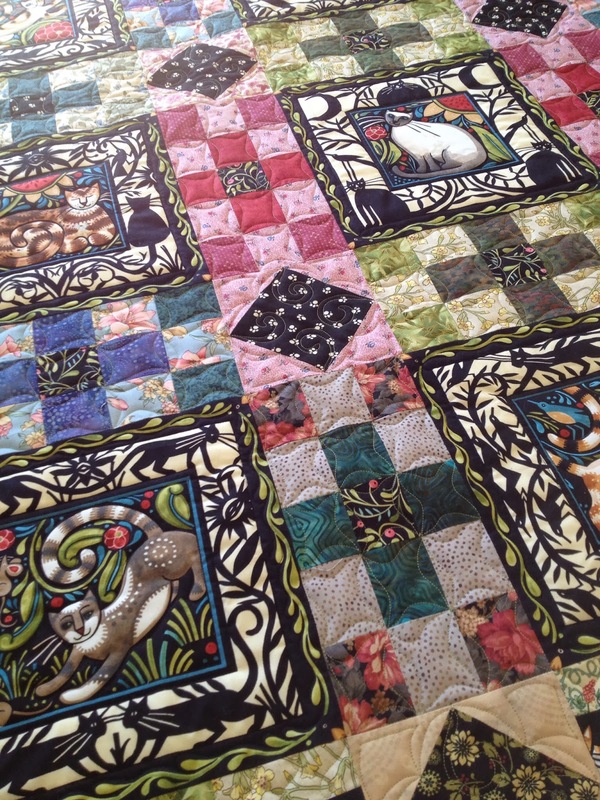 It doesn't really help the minimal quilting on the cat blocks, but again, that is life. She likes it and that is really all that matters. I used a greenish color Omni thread on all but the cats. 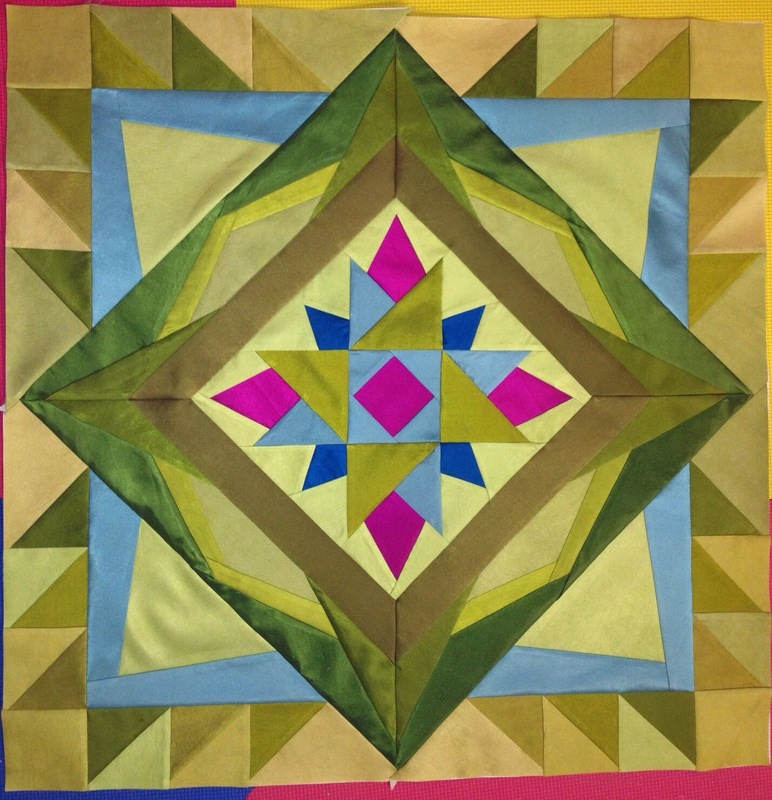 When you don't know what color to use, and the quilt has many, often quilters will tell you "baby-puke green", as it blends with many colors. It's a nice shade of yellow-green, and I use it often. The cats are stitched with black Omni. I outlined a couple square frames, outlined around the outer greenery and then around the cat itself. It is fun to do these smaller quilts as they do quilt up relatively quickly. 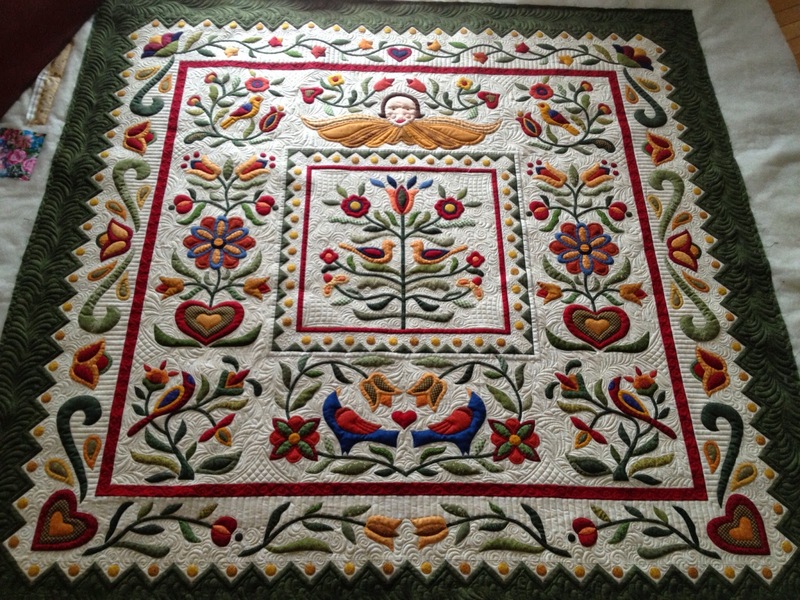 The quilt that came after this was a 7-day doozy!...116"x105", pictures and a story next time. 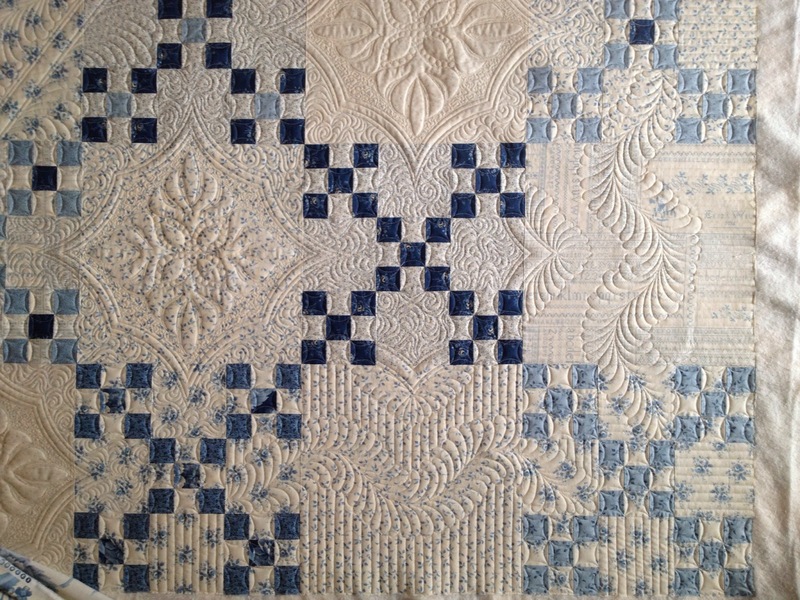 Here's my other new 2014 show quilt, which is somewhere between snowy Virginia and here. This got the 3rd place in the Traditional Category from MAQF. Hopefully it arrives soon because it needs to be at MQX in a mere 2-3 weeks. Autumn's Surrender is intended to depict the icy convergence from the glorious colors of fall to the crystalline and icy feeling of winter - Symbolized mostly by the fabric colors, and the fact that the quilted light blue silk is very icy in its appearance. This is 58" square, and is made from all silk Radiance. The silk is a little finicky to work with, but it sure does quilt beautifully. When I bought it, I found it for a steal of a deal, but they were 1/2 yd bundles. It equated to about $5 per yard, so I got one in a brown/gold/green shading and another in the blues. I wasn't really sure where the colors were going, in all honesty! Fortunately, the softer blues kind of marbled all together so I was able to use several of the shades at the middle of the quilt effectively. I chose to interface all my silk with a Pellon bi-stretch lite (which is more costly than the silk was), but it controls the shifty-ness of the silk. On the downside, though, it does thicken the joints somewhat, making pointy joints tough. 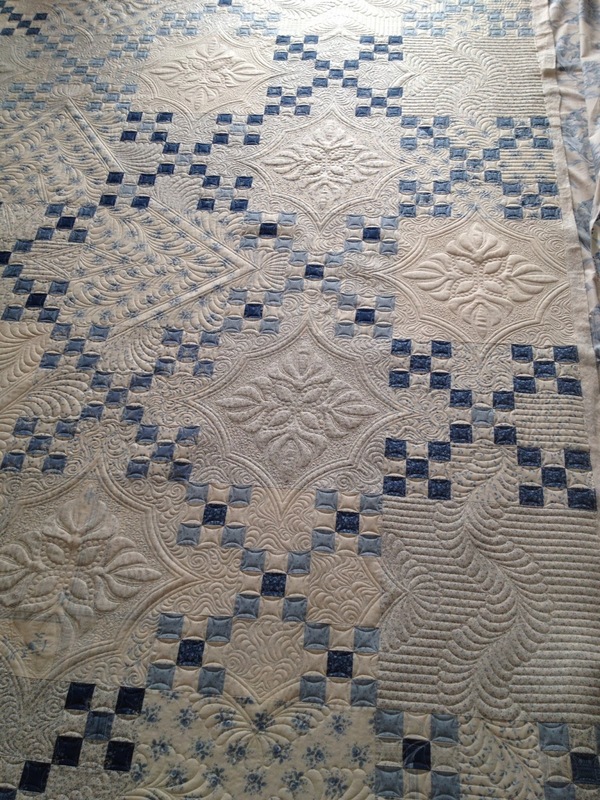 Several of the blocks used to make up this quilt were paper-pieced, but when I went to connect them together, it was impossible to get 8 seams to lay down. My solution was to applique diamonds on top of the joint, and then to cut away the bulk beneath. It's great when part of the solution to fix something becomes an integral part of the design as well. 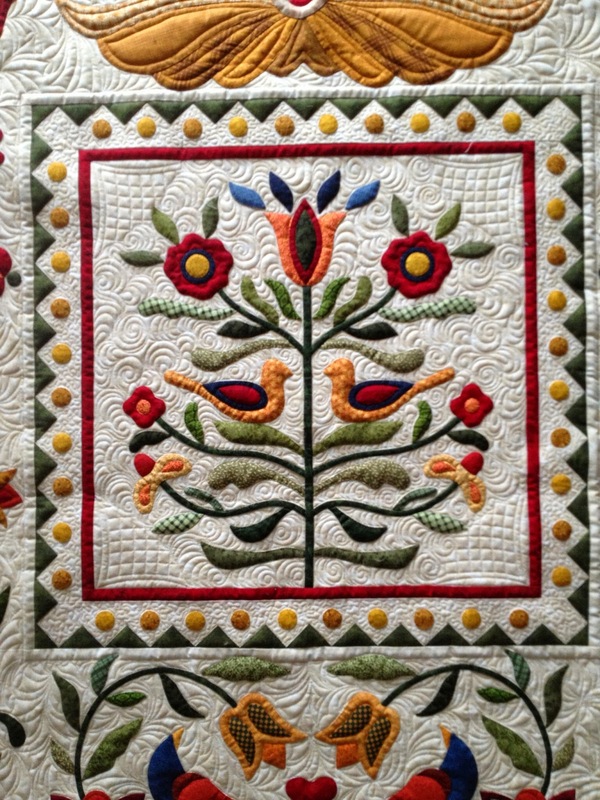 The entire quilt was stitched using 100wt silk thread. I used a number of shades from ivory to blue to brown and green. Except in a few places, the thread was matched to the fabric. It was a fun quilt to design quilting for too. I sketched out most of these sections on tracing paper so I could audition the plan with the fabrics showing through. Unfortunately, this plan means there was a good amount of tracing motifs onto the quilt. 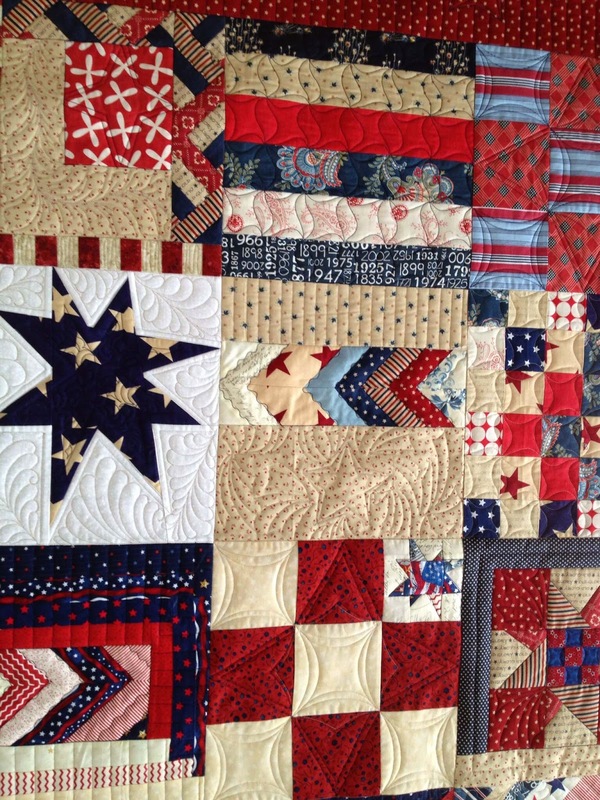 I love when you can bring elements of the piecing, like the diamonds, into the quilting. This really makes the entire design feel more cohesive. 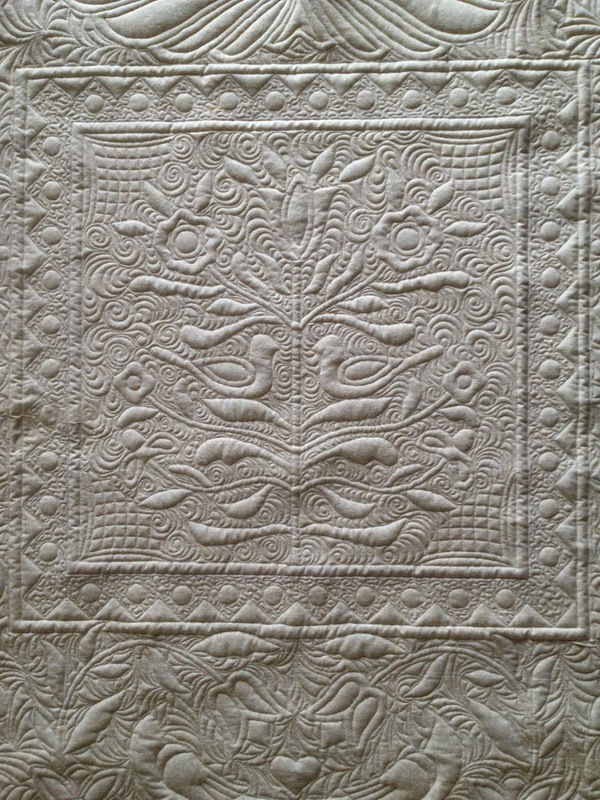 I spent over 100 hours on the quilting. The quilt has a 1/2" wide silk binding, which was a complete pain in the neck. Normally I put bindings on-the-bias, but I had to rip this off and redo it on straight grain (which naturally meant getting more fabric!). The binding is also interfaced, which gave the quilt a nice amount of extra body at the edges. I also hand beaded the edge with both seed beads and buggles -- fun crazy endeavor that took nearly 25 hours to finish! I also added a narrow (see below) rust colored velvet ribbon along the interface of the octagon. It had a purpose, but I loved how it turned out. There are little rust dots covering the ends (see top photo). The back is probably my favorite. The fabric is a tan cotton sateen, and it shows EVERYTHING...good, bad or otherwise. I wasn't sure at first when I saw all the dark brown thread back there, but heck, it is what it is. And most of it looks pretty OK to me. If you are lucky enough to be going to MQX in Manchester, NH next month, then you'll be able to see this in person. 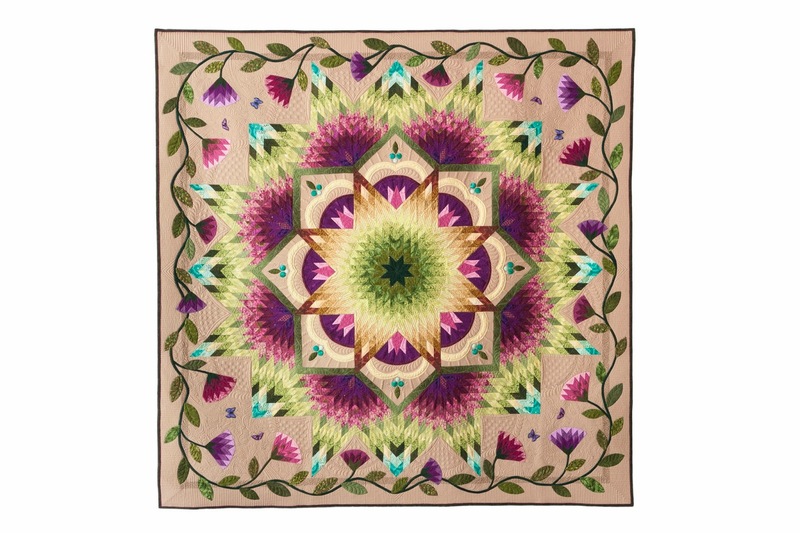 It will also be going to the Vermont Quilt Festival in June. I so love how the silk quilts that I have two more silk quilts in the works -- one is a wholecloth which I hope to be stitching before my kids are out for summer vacation, and a second that will be a 40" wall hanging.